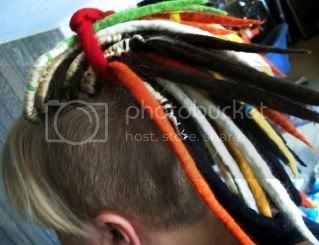 I am currently making felt dreads ready for Halloween but dont know how many i need to make for a full head. I only have 5 days left and really need to get moving. They are single ended as my hair is short. I have made 20 so far (will make some more after work tonight). Will also post pics after I have finished. 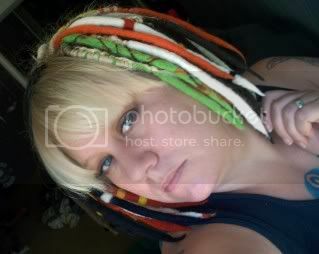 Re: How many dreads to cover full head? Depends on how thick the wool is as well hun, but I normally go for about 45 DE dreads for full coverage, with the dreads themselves about 1 1/2 cm thick. Better to make too many and not use them than make too little and have to make bigger sections. i made 60 fairly skinny DEs but only managed to get 35 into my hair. My hair is VERY thin and fine though. I have a severe undercut but very thich hair, on this intall I used 30 doubleenders. Hope it helps. Does the placement of dreads matter too? Can you cover more space with minding where the roots of the dreads are? Placement will be a consideration. Check out this video for some sectioning options. You can always to a combination of the 3 types.